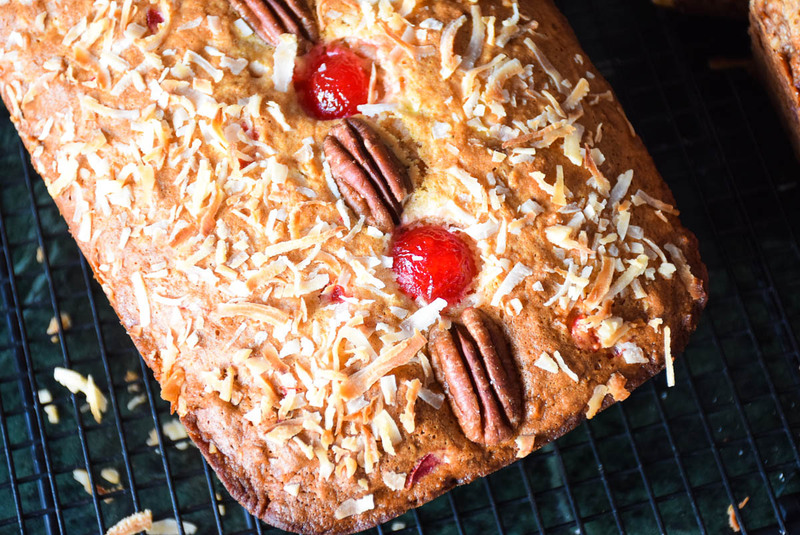 Full of banana, coconut, cherry and pecan flavor, this Cherry Coconut Banana Pecan Bread is a welcome change from the regular loaf of banana bread! Lazy weekends sometimes tend to inspire me. We definitely had a lazy weekend this last weekend. It was cold outside and who wants to go out in that? So, since I had a 3 day weekend and Grumpy was going to only be home with me 2 of those days, I decided to be that 4 letter word….that isn’t so dirty after all. L-A-Z-Y. Grumpy was too….if not more so than me! In between the TV and computer I would go into the kitchen. I went out for a bowl of Heart to Heart Cereal and an orange, then later a rice pudding cup (yes, store bought). Later in the day Grumpy got up and went out to make himself a hot beef sandwich with the leftover roast and gravy. Following him to the kitchen, I took notice of the two bananas that were too ripe to eat as is. I started thinking about bread and coconut and maraschino cherries and pecans. The next hour, my home started to smell amazingly delicious! It was an agonizing half hour after I took it the bread out of the oven and set it to cool on the counter. Waiting to cut into this bread seemed like forever. Finally, after about 30 minutes I decided I could take it no longer. I sliced off two slices, put a little smart balance butter on top and headed back to my room where I continued to watch my sci-fi movie and got all cozy under covers and savored every bite of that bread. Mix together flour, coconut, baking powder, baking soda, salt, and chopped pecans. In a large mixing bowl, mash bananas well. Add eggs, one at a time, and whisk until mixed well. Add sugar and extract. Beat well. Stir in cherries. Add flour mixture, and stir just to combine. Spoon into greased 9x5x3 inch loaf pan. Oh, boy, does this look DELISH!!! And a healthier low cal version is much appreciated! Looks absolutely delicious, Shelby! 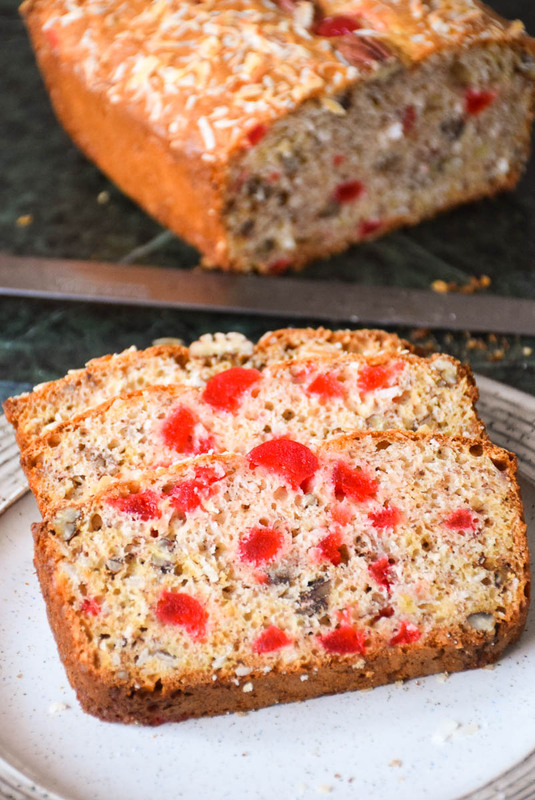 Love your combination of cherries, bananas and pecans. Definitely one to try. Mmm, looks good! Glad you have the day off! Thanks ladies! Its so good I'm having a piece for breakfast right now. ;o) I've already torn my closet apart and once breakfast is over will be putting it back together minus quite a few things thankfully! 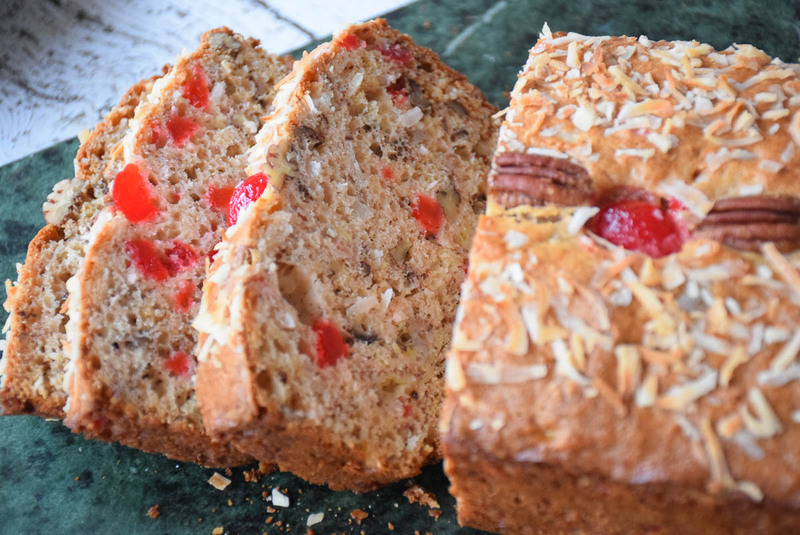 This bread looks yum-world…love the cherry colour inside the bread! What a lovely looking bread, and yum too. Hope you don't mind if I bookmark this and try it out for my self. Hope you visit my blog and if it is not too much, please do follow me also. Thanks! This is so pretty Shelby! Sounds like a great combination. Thanks Valerie! It was so yummy 🙂 I finished the loaf off when I was being lazy yesterday afternoon – after I cleaned the closets out! Ohhh. I am loving this combo! Yum! What a great flavor combination – I've never thought of these together but I bet it's amazing. Can't wait to try this. It looks very delicious. Thanks. its yummy Peggy 🙂 I am a huge cherry lover and had a hard time NOT eating the bread! What a PRETTY bread!! Thank you for sharing. This looks delicious! I might just try this with my gluten free flour blend, thanks! Debbie, let me know how it turns out! Well by the end of the day yesterday Linda I was eating the last bit of that bread. Grumpy had 4 slices total. I ate ALL the rest! lol It also feels good knowing I was lazy and my house STILL looks good today. I don't know how that happened!